ERC 1650 are digitized video transmission equipments de transmission. ERC 1650 allow transmitting video signal on two optical fibers multimode or singlemode. 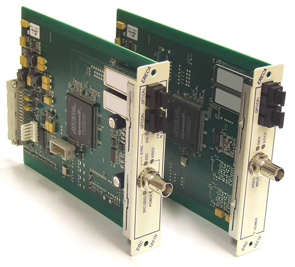 ERC 1650 assumes optical signal transport securization by the use of double component as on the receiver and transmitter. So optical attenuation are reduce and switching time control is minimized. Transmitter as receiver is presented on a plug in module with analog connection on a BNC for PAL, NTSC or SECAM video. For fibers 2 optical SC/PC connectors are available.